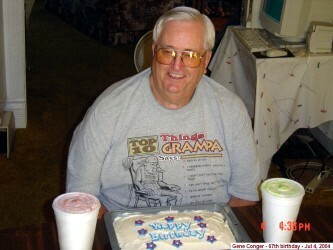 Ernest Eugene was born July 4th, 1937 at the John Griggs home on the corner of Hwy 149 as it enters Exline from the west. We moved to house right across from the school in 1938 and I went to that school for first 8 years (no kindergarten). 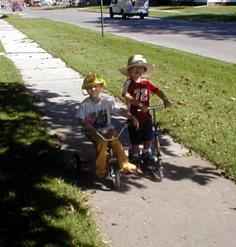 We lived right across the street (south side of street) from the school which is now gone though the house still stands. As the Exline High School was closed the year I graduated from 8th grade, I attended the High School in Cincinnati, Ia. for 4 years and graduated in 1954 when I was 16 years of age. 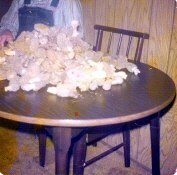 I then stayed in Brookfield, Mo. with an uncle, Tom Seals for a few months. Got my first job with Brown Shoe Co. there in Brookefield making shoes in the fall of 1954. 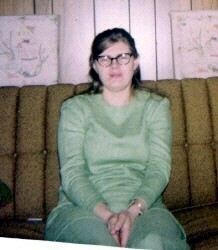 Quit there and moved back to Exline, Ia in Jan 1955 and got a job in Centerville, Ia at the Box Factory (Baxter Box). Quit there and went north for more money and I took a job at Gray Iron Foundry in east end of Marshalltown, Ia. working with Litel Bates, Freddy Sumpter and Danny O'Donnel. Turned 18 years of age while working there. 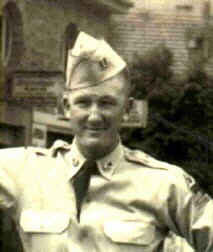 Enlisted in the Army's 3rd Armored Division (Gyroscope) with Bob Hudson and Gene Hamm in July of 1955 soon after turning 18. We went to Des Moines (where Gene Hamm was separated from the group and did not go to 3AD) then on to Camp Chaffee, Arkansas where we got all clothing issue, shots, etc. then on to 3AD at Ft Knox, Kentucky where we took "Basic Training" in the units we were assigned to. We got there a little late which in my case, shortened an already reduced (6 week), schedule because they felt Ordnance units didn't need the full 8 week basic training. I think I received just a little less than 5 weeks of the training. Emphasis was given to our advanced training which I was assigned to Co. B 122nd Armored Ordnance Battalion. 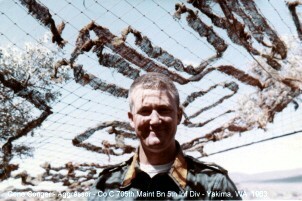 At the end of basic training, we were in formation by the Company Orderly Room when the 1st Sergeant announced that the different company sections were set up at table inside the orderly room and that we would select that same day the jobs or training that we would be doing the remainder of our enlistments. He said that when he gave the command "Fall Out!" it was first come, first served-the first ones there got their pick of jobs. I was lucky as I was in direct line with the door and was one of the first on the landing and in the door. There were several tables set up around the room in a crescent starting at the door. The first table had Headquarters Section, supply, clerks and the like which I flunked typing in high school so I figured I'd better pass. Went to the next table and it was Service Section; heaters, carburetor/ignition, machinist, etc. and I almost took one of them. The "Technical Supply Section" (all ordnance parts in our command) was in there somewhere. Not sure but I think the next table was Wheel & Track Maintenance and I did not want that as I had seen some of it and it seemed to be pretty dirty. I had gone through all the tables there except the last one and I was standing there thinking about trying to go back to the Service Section/Carburetor-Ignition table when the guy at the Wheel & Track table, Sgt.Truslow, said "better make up your mind kid, you're running out of tables. Just what kind of job do you want, anyway?" Having come from a coal mining area where even that was petering out, I blurted out "I don't know, I'll work at about anything as long as it's clean and not too heavy work!" (I sure didn't want to dig coal). And to my astonishment and later delight, the guy at the very last table, Sgt. Mullett, said "Come on over here son, I think I have just what you are looking for" and signed me up for Fire Control Instrument Repair in his Armaments Platoon. I then went to school in Aberdeen Proving Grounds, Maryland and was given MOS 403.20 Fire Control Instrument Repairman and worked on artillery, tank, etc. gun sights and other optical equipment like binoculars and telescopes - I really loved and appreciated the job. I then returned to Ft Knox and stayed there until May 1956 and then we, still 3rd AD, went to Coleman Kaserne in Gelnhausen, Germany for 2 years and then home to end the 3-year enlistment. 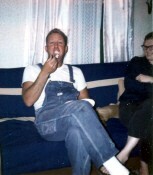 I turned 21 years of age coming back on the boat and was released from active duty and went into inactive reserve on Jul 9, 1958 in Ft Sheridan, Il.. I only relate this story of the military training for some of the old-timers that might see it and have interest and to advise the youngsters to always speak up and at least let the world know of your aspirations, your Sgt. Mullett might be listening. 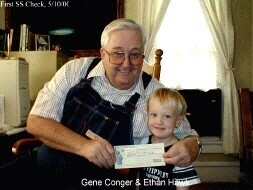 After I got out of the Army in 1958, I worked at various jobs around Appanoose county. The county was a "depressed" area in those days because of the shift of industry from coal which we mined to natural gas and fuel oil which we didn't. Has been depressed since I can remember and good jobs were always hard to find. We have had a continual drain on the local population because of this, the county losing at least half of its population during my lifetime, so after about 2.5 years thrashing around in this area looking for a good job and not finding it, I went back into the Army for another 3-year enlistment. I went to Alaska this time and was there in Ft Richardson for 2 years with the 24th Ordnance Company after which I rotated back to the states and spent 1 year with the 705th Maintenance Battalion of the 5th Infantry Division (Mechanized) in Ft. Carson Co. and got out in Dec 1963. Fire Control Repairman, again. Sometimes even an "aggressor" - in 5th Infantry Division Yakima, Washington exercise. While in Ft. Richardson, Alaska I managed to go to their NCO Academy. It was not much of an institution as far as size, etc. goes but I sure learned a lot at that little school and have always appreciated what they taught me as it has stood me in good stead ever since and I yet today successfully employ principles that I learned there. After finishing my 2nd 3-year enlistment in Dec 1963, I went straight to the "Quad-City" area (Davenport, Ia.) 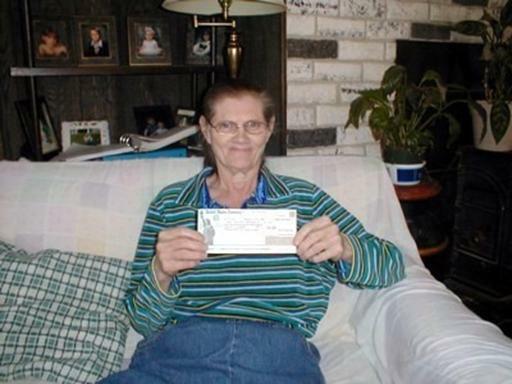 and quickly found employment with John Deere Malleable Foundry in East Moline, Il. I worked there until I could get a job at the Rock Island Arsenal where hopefully I could make use of my military training for personal advancement and "military time" for retirement. I met many people and families in the Quad-City area which were from Appanoose County, IA. It was not uncommon, when working or just conversing with neighbors or acquaintances, to find either they or their spouse were from our home town area and had made the move there during or soon after THE WAR. This helped me to settle into life in a strange town. 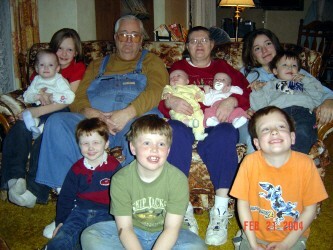 Shirley's family, parents Bernice and Emil and two Brothers and two sisters, are small farmers from NE of Wyoming, Iowa. 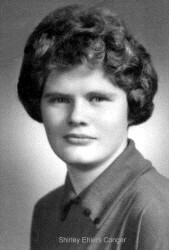 She went to the schools in the area; Country School, Monmouth and Wyoming. 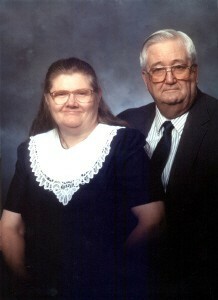 One of her sisters, Donna married Ronald Conger, Gene's brother, thus was acquaintance of Gene and Shirley made. 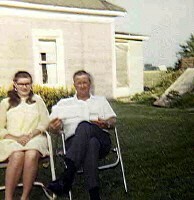 So having made acquaintance, Shirley and I were quietly married in the Methodist Parsonage in Moulton, Iowa June 17, 1971 and just as quietly celebrated the event with my brother John and his wife and my parents in the lengthening shadows of my father's Troy's front yard, next to "Banty" Sales' home. And about every two years (for six years) another child was added until we had 5 kids, a dog or two, some cats and a cockatoo bird (held here by Naomi). Shown here left to right; Shirley w/Naomi, Danny, Sarah, Naomi with the bird and Sam with a doughnut. 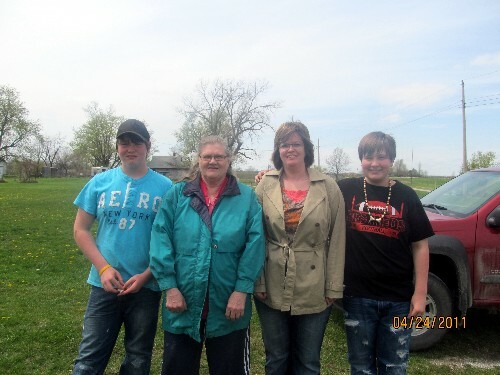 This all happened down in Exline, Ia and the kids went to church at the "Christian Church" where everyone is pretty nice. The kids went to grade school in Cincinnati, Ia. and we lived in a double wide "trailer" in the northeast part of Exline. When we set up our domicile in Exline, I went to work on construction projects in the area and sandwiched between them, I worked at Iowa Steel & Wire where we set up the "Wire" plant, later "Penn Dixie". 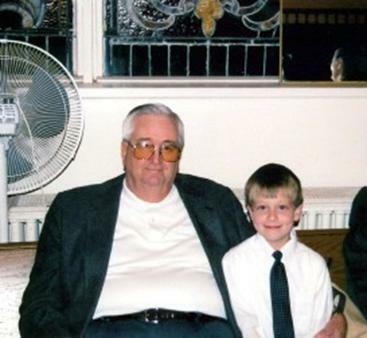 As you can see by the photos, I was pretty slim in those younger days but cake at my mother's and lots of fried fish and morel mushrooms have collected their toll. My last construction job was Reed Construction out of Kirksville, Mo who built the Young Radiator Company plant here in Centerville, Ia. I worked building the plant and was "laid off" just before they were completely done. 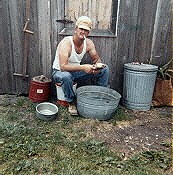 Did some fishing which some of it can be seen at http://www.eeconger.com/fn1.html - haven't done too much lately (2003) but sure did back in latter 1900s. Since I was contemplating a move from construction to manufacturing, I beat it over to the local community college in Ottumwa and using the "G.I. Bill" financing, took some refresher courses on drafting, shop math and machining out at the airport. I ran into Larry Reed and Terry King there (later Young Radiator Co. employees) and we went to school together for awhile until Young's responded to my resume and called me for possible employment in the early summer of 1975. Larry & Terry came to Young's after they completed the course. 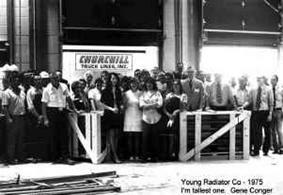 I started employment with Young Radiator Co. on June 2nd, 1975. Some maintenance people were in place when I went there in the first production group of 11 people. Our 11 people drew clock numbers and I drew no. 27 (as I said, there were some maintenance employees there when we got there). We received some training in soldering and more shop math and drawing at the same time we started making radiators. The back doors were still not completely installed when we shipped our first radiators (destined for forklifts some where, I think). That's me in the dark cap standing on an 8-inch concrete block in front of the piping conduit in between the doors. That's Fred Young Jr. in the tie just in front of me and the Plant Manager, Ron Reynolds, just to his left. The second group of production people had been brought on board just prior to taking of this picture. Soon after this start-up phase, I was asked if I would be interested in the job of a Quality Control Manager and I accepted, of course. 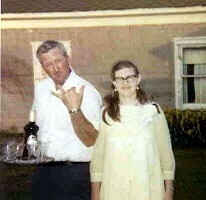 And that's me on the left. 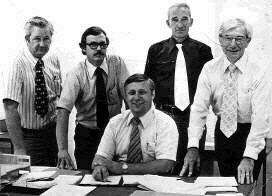 My buddies on the plant's management staff, left to right; John Erhart Production and Inventory Control, Ken Lauterbach Personnel, Bernie Moore Industrial Engineering and Bob Webb Assistant to Plant Manager. We appear to not have a Production guy at this time. We produced radiators for just about everybody in the country that used radiators except the automotive industry. We served markets in industrial, mining, agricultural, military, construction, oil, transportation (especially railroads) and just about everything - anything that used diesel or natural gas engines and of all sizes and descriptions. Our sister plant in Matoon, Il who mfg'd the large stuff, made and shipped one radiator (in sections, of course) via rail and boat to a gold mine in S. Africa. It took up seven flatcars space to load/transport it to port of embarkation. 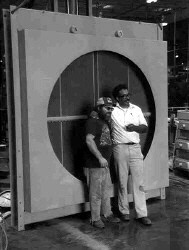 Our biggest one was as the picture to the right with Welder Belzer and Production Manager Jones. This photograph was taken during a presentation of a Quality Excellence award by FMC Corp. of San Jose, Ca. to the Centerville Plant. There were two other awards, very similar, Targets For Excellence Award by General Motors Electro Motive Division of La Grange, Il. and the Department Of Defense Blue Ribbon Award for which I do not have the photographs. That would be me, Gene (or Ernie as I was called at Young Radiator Co.), in the upper left corner with the tie and ID tag on my jacket. 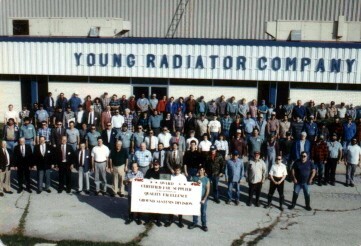 Young Radiator Company was sold to Motive Power Industries which in turn merged with Westinghouse Airbrake Company and in the reorganization of the company, the Centerville plant (with their product line) are being phased out. Since I am retirement age, I have taken the early retirement package and have retired. I'll lay around this summer doing some put-off chores and familiarize myself with this new life then start looking for something to occupy my time this fall. Not sure what the wife is planning but I imagine it would have something to do with housewiving and relaxing at every chance? But now, a photo for retirement ........ and now it's getting close to time to say "OK kids, its all yours, just let the Grandkids come over and play every now and then" ......... after all, the kids are what its all about, isn't it? 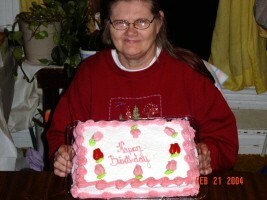 Here is Shirley on her 60th birthday (Feb 17). There was cake , ice cream etc and you can see the cake in the photo. Nothing fancy but message was clear. 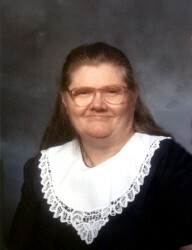 She is a valued member of the family and it couldn't function without her. 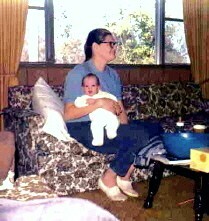 Grandmas, are after all, the greatest people on the earth - just ask anybody. 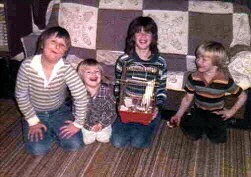 And here is the OTHER photo of Shirley's 60th, as you can see, the family has grown. Got nearly the whole crew here ………… short just one for the picture, Troy. 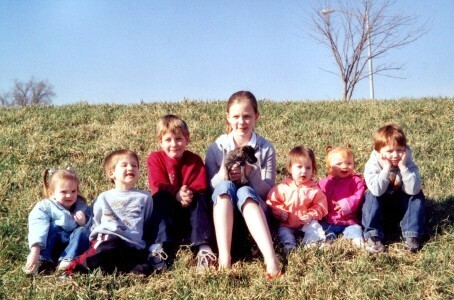 Riley, Shonmikel, Ethan, Emily, Zoie, Carlie, Nickolas. Well, now – looks like Shirley has retired for sure. She has her first S.S. check, received April 3, 2006. Looks like her recent illness has caused some weight loss but she seems in good health, energetic and buzzing around the house working at this and that ………….. a lot of quilting which she does pretty fair job at it. I don’t know who invented these things but I don’t think I’ve met anyone who wouldn’t eat one ……. 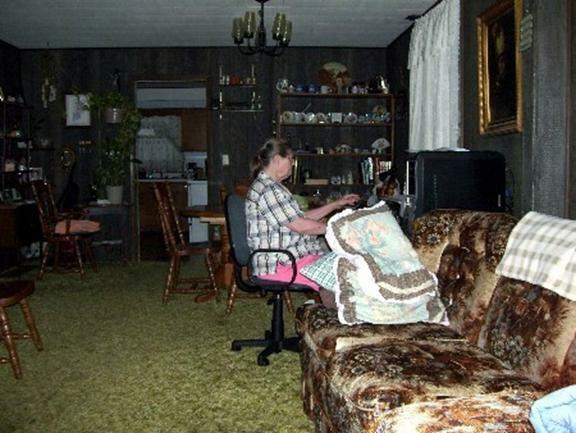 Shirley’s getting better on the computer and has taken up gaming but kind of looks like she may have got the short end here. I guess it's been too long since any pictures were posted to this page. Look at this one! 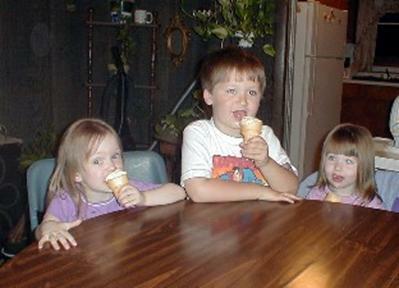 Troy, Shirley, Naomi & Ethan. They are bigger than she is already! !